In the business world, labor unrest, hard feelings and pushy bosses can lead to a strike. In the Circus world, it's a reason to do a show. 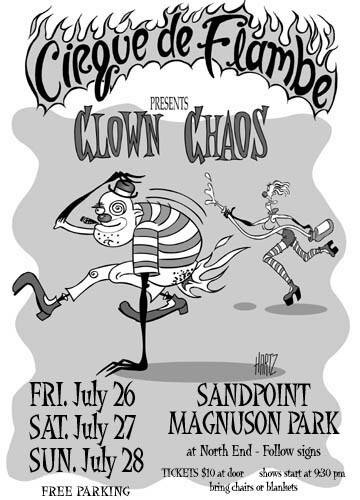 Since we are unable to bring order to our clowns, Cirque de Flambé, America's only flaming one-ring outdoor circus, was forced to create a new show, "Clown Chaos". This wild show presents several brand new acts never seen before on any stage. It also presents some of the Cirque de Flambé's most popular acts, which have been totally revamped for this new format. This is the show that was so hot, it was banned in Ballard! As a local resident stated; "This show is too long (75 minutes), too loud (crowd applause), and the content of the show is wrong, wrong, wrong! (clowns fighting with fire)" The show kicked off for a three day run on Friday, August 7, 2003, with additional shows on Saturday and Sunday, August 8th & 9th, 2002. The circus show is presented outdoors in festival style. Audience members are encouraged to dress warm and bring their own blanket and chair, or if they choose, their own couch. Beth Farnham, Fremont Arts Council and our wonderful volunteers!